After buying a stroller, not many parents think about the fact that sometime down the road they’re going to have to clean it. Because strollers are made of different kinds of materials, cleaning them well and fast is going to take some research, and trial and error. 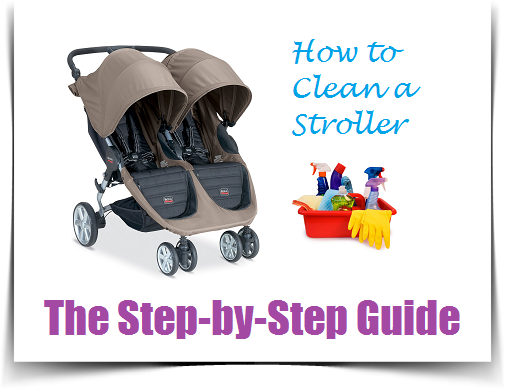 Knowing how scarce time gets when you have kids, we decided to put together this step-by-step guide on how to clean a stroller, so you can find everything you need to know in one place. We’ve made some research on all the aspects of the cleaning process to make sure that we include everything that matters. We’re going to take you through all the important steps that you need to go through in order to complete the task as efficiently as possible. Strollers are a really fun and useful product for both you and your kids. They enable you to do more things with the little ones. That’s also why they tend to get dirty pretty fast. Especially during the summer months, taking your kids in the park, to a petting zoo, sandy beaches, is going to put its mark on the stroller. The wheels are the part of the stroller that will probably gather a lot of dirt and sand, depending on where you use it, and if the area you’re going over is not dry, the dirt will stick even better. The seats and the fabric that the seats are made off can also get pretty dirty over the course of a few months. Think about all the snacks your kids are having while seating in the stroller. There’s a high chance that crumbles will get all over and into the fabric. Also, chocolate and other favorite sweets of the kids, will inevitably land on the seats as well. It’s not a sure thing but let’s say that statistically speaking it might happen. Knowing the right time when to clean your stroller makes all the difference in the world, between feeling this task like something painfully hard, and not thinking about it at all. Because strollers are made of different types of material, that get dirty in different ways, most parents decide to clean it far too late. Because of the wrong timing, the task will be pretty difficult, having to insist on the different materials using different techniques will add up not only in your fatigue level, but also in time spent on cleaning. It ultimately takes away from quality time spent with your kids, and that’s not a favorable scenario for anyone. Take a look at all the different parts of the stroller when you get home, after every trip outdoors. If you notice dirt building up on the wheels, that your kids have let some crumbles fall on the seat, or any other kind of pronounced change for worse in the condition of the stroller, it’s probably time for you to clean it. To deeply clean your stroller, you would have to get the fabric off of the frame, get the wheels off and start some thorough scrubbing, preferably with a toothbrush. It’s as difficult a task as it sounds, but you’re going to get the stroller back to the condition you bought it in. Because most people don’t have that much time available on a regular basis, and because you actually don’t need to do such a deep-cleaning drill too often, there are some steps that you can take to maintain your stroller in a generally good and clean condition, fast and without feeling it as a chore. One of the first, if not the first thing you have to do when deciding to clean your stroller is reading the instructional manual to find out about any specific recommendations and restrictions concerning the fabric and the materials it’s made off. There you can also find more information on removing the parts, in case you want to do some deeper cleaning. After consulting the manual, which you will have to do only the first time you want to clean it, you should remove toys, accessories and other detachable parts. Don’t forget to empty any storage areas, like the baskets from underneath the seats, or the side pockets that some models have. Of course, we consider that at this point the stroller is locked in the open position. What you removed at this stage will probably also need some degree of cleaning, so put them aside to deal with them later. Treat every accessory properly, so, for example, if your stroller features some trays fro the kids and for parents, treat them like any other dish you eat off. After removing all the accessories and detachable parts, start by vacuuming the seats. Vacuum the entire fabric of the seats and insist on the seating areas because that’s the area that collects most dirt. Because your kids have different kinds of snacks, the seat fabric can collect a pretty extensive variation of crumbles. Another type of dirt that you might need to remove are spots. If you notice any spots on the fabric, getting them out will probably take more than a wet cloth. If that’s the case use some dish soap, and with a cloth scrub the area. The dish soap will get out most of the common stains. We recommend you use something organic, if possible, to reduce the chemical residues that might stay on the fabric. If the stains don’t leave without a fight, you can put the fabric parts into the the washing machine, of course, if they are machine washable. Most strollers have a metal frame and/or have parts like handles and wheels made of plastic or metal. These parts can get pretty dirty, especially the wheels. You’re going to use the stroller each season of the year, and for most of the year the outside conditions will leave their mark on the wheels. If your stroller is very dirty, you can use a hose to remove bigger chunks of dirt, just like washing your car. After getting off the first layer of dirt, that you would see from a few feet distance, you can use an all-purpose cleaner and a clean cloth. Put some cleaner on the cloth and scrub the areas that need cleaning. If there are any stubborn stains you will have to put some muscle in. You can also use products that are specially designed for this. Don’t forget to properly dry all the parts of your stroller, because the metal parts could rust and the fabric might build up mold. You can do this cleaning cycle pretty often because, it will only take about 15 minutes, and overall, you will not feel like you have to go through a tiring and time consuming process, like you would if you’d let the dirt build up. Besides having a regular cleaning schedule, the place where you store your stroller has an equal, if not greater impact on how well it preserves over time. If you store it in a place with high humidity, the metal and plastics will degrade faster and the fabrics might build up mold after a few months. We recommend you keep your stroller somewhere inside the house, in dry place, like a closet. This is an important aspect to consider, because if you don’t, it might jeopardize all your efforts. Check out this video to learn how to clean and care for the Baby Jogger City Mini. Even if you have a different stroller, most of the advice applies universally.